The RNLI boathouse that was built on Kingston Beach in 1933 was knocked down in 2009 to make way for a new £4.2 million cathedral-like structure. 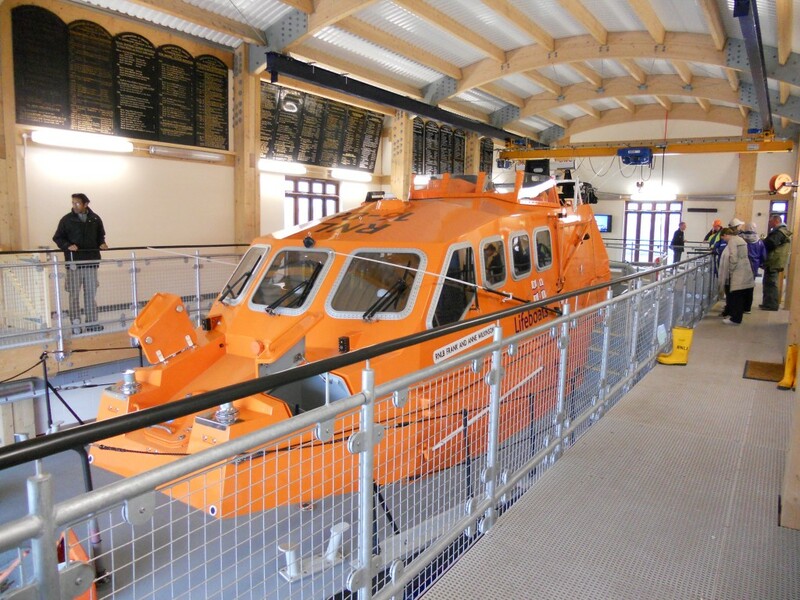 The highly advanced building, which opened in October 2010, houses two different rescue boats and features exposed timber throughout. The larger of the two boats is housed within a cavernous hangar with a vaulted roof. It is a 2,000 horse power Tamar class lifeboat called Enid Collett which takes its name from the late donor whose legacy funded its purchase. It cost £2.7 million, weighs 31 tonnes and can hold up to 118 people. 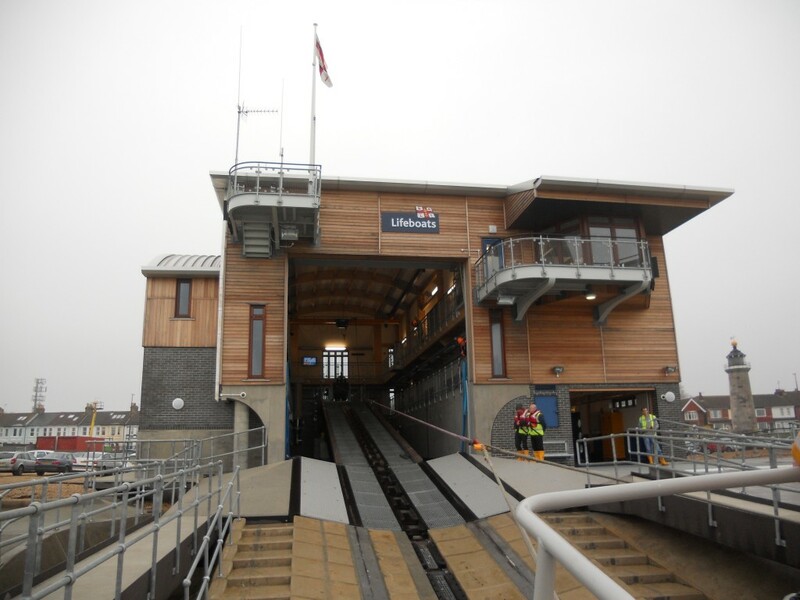 A smaller inshore lifeboat is housed within the eastern portion of the building. Each boat has its own new slipway leading to the sea below. The frame of the building consists of huge glulam beams (from Austria apparently). Much of the exterior has been clad with timber and timber windows have been used throughout. Other environmentally friendly features include a ground source heat pump and rainwater harvesting. I was lucky enough to go out on a trip to the Marina on Enid Collett on the day that I visited the boathouse. The thrill began the moment that the boat was released from its shackles, a second or so before it hit the sea at the bottom of the slipway. Although it was quite misty, I loved looking at the buildings along the seafronts of Hove and Brighton from a fresh perspective. Up close, buildings look very different to how their respective architects would have drawn them. From street level, for example, the lower levels of a building dominate the view. From afar, the proportions even out. The seafront compositions of Brunswick Town and Kemp Town were particularly pleasing when viewed from the boat. The team at Shoreham is headed by Coxswain Peter Huxtable, a local fishmonger, who explained to me just how much the RNLI relies on donations and volunteers. It receives no government assistance whatsoever (and doesn’t want it either) and the new boathouse was built following a massive community fundraising drive. Funnily enough, Texaco donates the fuel for the boats at Shoreham – which is not at all cheap. A dinner is being held on Saturday 14th May at the Grand Hotel to celebrate the opening of the new boathouse and tickets are still available. I’ll certainly be there. Please call Geraldine Huxtable on 01273 454545 for more information.